We here at Icygeek are based at the epicenter of college basketball bracketology, but the fact is that we care more about Magic: the Gathering than basketball (this is considered heresy in the Hoosier state). 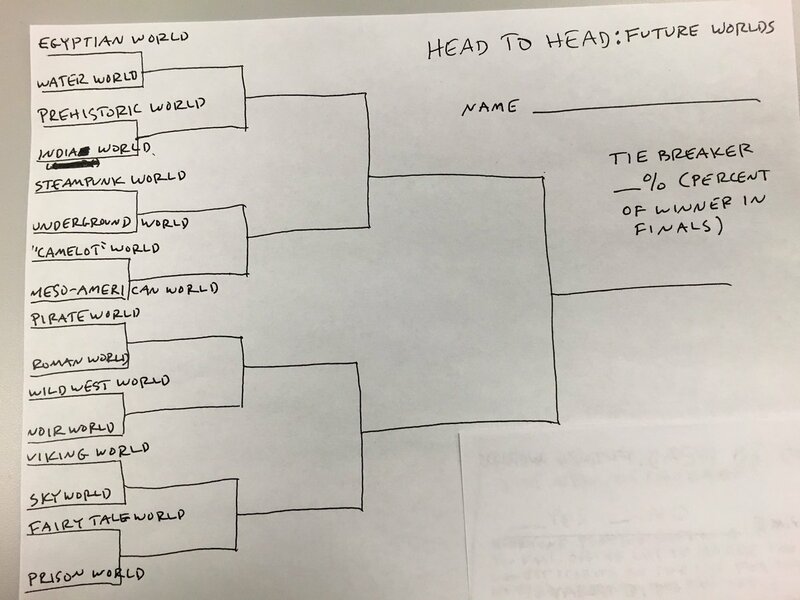 While we have watched in participated in Mark Rosewater’s (Maro’s) head to head brackets since he started doing them on Twitter, it is the one starting on February 29 that really gets our interest: a match-up of future worlds. These are reported the 16 most request themes for future Magic planes to have sets based within. With a look ahead, here is what we forecast. There’s a rumor going around that the Fall 2016 set will be Egyptian themed. With the idea that such a set will feature gods, some may say it is too soon after Theros for such a set. However, given how it definitely seemed too soon for returns to Zendikar and Innistrad, this is hardly a handicap. Honestly, a Water World would be far more interesting to see how WotC would cope with a world that seemed to be more blue mana dominant than Innistrad is black mana dominant, and “Kevin’s Gate” may be too far ago for younger players to know. However, Egyptian has been a pop culture theme off and on since Napoleon Bonaparte decided to take potshots at the Sphinx, I definitely see a pyramid scheme afoot, whether the rumors are true or not. Wouldn’t you know that the time I would love to keep referring to the Great Designer Search 2 (GDS2), WotC’a website is in 404 overload. (I still hate that the site doesn’t update until 11am for no real reason except for the lolz). Anyways, Ethan’s world in GDS2 was a prehistoric world with Human Apes, Merfolk Fish, and Vampire Bats (why not Elf Squirrels?). Dinosaurs are beloved, so this is a slamdunk winner of an idea…a number #1 seed if they had actually tried to seed this bracket. Here’s hoping that when they eventually do this setting, they make some homages to the G1 Dinobots (5 Dinobots, 5 colors). A Steampunk theme would be fun, and is probably the closest to a “modern” setting we’ll ever get. However, considering how lowly perceived steampunk movies like Wild Wild West and League of Extraordinary Gentlemen, it is unlikely the support will be there for this setting. There was an Underground setting for GDS2, and it was perceive better than one would believe, so we are predicting Underground. There are differences between a regular medieval world and a Camelot setting, but not that much. Meso-American may not have won other matchups, but it will probably win here fairly easily. It’s amazing how little pirates have shown up in Magic over the past two decades. Heck, when we’ve designed cards for our Disney: the Gathering expansion, we made sure Grixis pirates could be a thing. Given that Theros wasn’t that “over” with the diehards, who comprise the majority of Maro’s followers, I doubt something very similar to Theros but not Theros would do. Wild West was a setting in GDS2 (yep, still getting 404s). Sadly, the guy who was designing it was the second or third guy eliminated. He had a problem with reflecting the setting given the tech level Magic R&D restricts the settings. The best mechanic to reflect gunfights was Clash from Lorwyn, and that mechanic was not well received (it was given a 9 on the Storm Scale). Still, it is hard to imagine much interest in a Noir setting; Conspiracy sets are the closest we’d come to it anyways. Thus, even with all the problems attached to doing the setting, Wild West it is. Those who follow our proprietor’s Tumblr page know that his plan, should he ever participate in a GDS3, is to have a sky world (assuming similar rules for the contest as GDS2). One would have to balance having more flying than usual, while not having too much flying. Of course, a GDS3 participant with such a world will have trouble with Maro’s hatred of green fliers with the need for such a setting to have a few green fliers. (The setting is a combination of D&D’s Elemental Plane of Air and Magic nostalgia, with the main non-planeswalker protagonists being non-flying birds…which on this website should be seen coming not just for miles, but for AU‘s. However, vikings are a fairly popular fantasy trope, with a very good TV show on History Channel (althro season 3 was “meh” compared to seasons 1, 2, and so far, 4). Thus, Viking will win, althro it will bring flashbacks to the red creatures of Ice Age. Somehow there is a difference between Fairy Tale World and Lorwyn to some, including Magic R&D. But is there enough of a difference for the voters, especially when a Prison plane was one of the final eight on GDS2? We don’t think so. So now we come to the Quarter finals… No real point for “should wins” here, so “will wins” only. If an attempt to actually seed these plane ideas were made, these two planes would probably not face each other yet. But they have, so they will. An Egyptian world would give some opportunities to reprint Arabian Nights cards, but with the Reserved List so revered by R&D as it is, this is not the time for it. (Once again, ignoring the Fall 2016 rumor.) However, Dinosaurs are very desirable and with Ethan obviously liking the world, and Maro obviously liking Ethan enough to hire him, it would be a good set and we’d have some idea what to expect…althro it will surely evolve from what it was in GDS2. Outside of Magic players from the Americas, we doubt there is that much interest in a Mayan setting. Also, the Underground setting showed to have some merit in GDS2. So we are going underground…as it were. Remember what problems we mentioned just last paragraph about a Mayan setting? The Wild West setting will have the same problem, except to a lesser degree. It will also be sabotaged into not having six shooters. Pirates are too kitschy to ignore and should win this fairly handedly…maybe 65%-35%? We have doubts about how popular a Prison world would be, but Vikings have pop culture resonance. Thus, we go a-viking. Underground lucked out in its lace in the bracket, but here’s where it gets steamrolled. Don’t be surprised if Prehistoric wins with over 70% of the vote. This will be an interesting match up, especially since Vikings were pretty much pirates of a specific time and nationality. Honestly, it would be best if they combined a Pirate world and a Water world, and have vikings being the most Temur of pirates around. Anyways, we say the generalist (Pirate) beats the specialist (Viking). This entry was posted in Magic: the Gathering and tagged Head 2 Head.